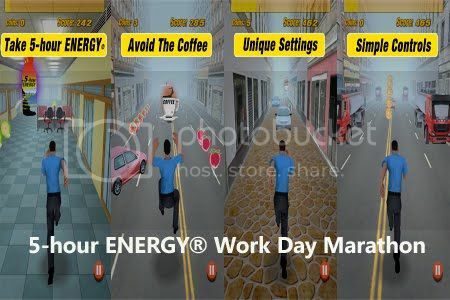 Everybody's favorite energy shot, 5-hour Energy, has launched a new mobile game called 5-hour ENERGY Work Day Marathon, which will give players the chance to win real prizes related to the company's sponsored events and celebrity partners like Jim Furyk and Clint Bowyer. The game can be found here in the iTunes app store. The game is basically an obstacle course to get through the work day, requiring the user to tilt their mobile device to avoid obstacles along the way. Naturally, getting the in-game 5-hour Energy bottles delivers a boost as the user navigates levels, while hitting a coffee cup (a 5-hour Energy alternative) will cause you to slow down. Players can collect five different colored coins along the way which represent the five fruit flavors of 5-hour ENERGY shots. This, of course, isn't the first time a brand has used mobile gaming to promote its sports partnerships, but it may be the first time one has asked consumers to pay for the privilege. As PandoDaily points out, the 5-Hour Energy game unlike most all other advergaming experiments might actually make the company or its production partner, Imovation, some coin to boot. It's $.99 per download and 35,000 coins can be purchased for $4.99 to accelerate your way through the game. Will users pay to play this advergame?